I hear that the “listicle” is going out of fashion in the e-journalism world. Yet I am compelled to create a list – because that is what makes most sense for this post, and because it provides a little concrete ROI. So let me share with you the six things I learned in launching this deck. One thing I learned from being president of RISD – an experience that I discussed at length in “Redesigning Leadership” – was how important it is to lead into existence what others feel need to happen. This sounds a bit different than your having your own vision, and that is as it should be – because having your own vision doesn’t really achieve anything. It just sits inside your head. What’s better is to figure out what others are envisioning as a collective. Look for it. Find what most closely matches what’s inside your own vision so you can at least take it on credibly and with integrity. The #DesignInTech Report is the result of thousands of personal interactions – eating dim sum brunches with designers, hosting events at places like FuseProject and Ammunition, and hanging out with all kinds of students at hackathons and office hours. Working with John Donahoe, CEO of eBay Inc., and the hundreds of designers, researchers, and writers across the company highlighted the challenges and possibilities for design even in a company of that scale. Each individual I met seemed to ask if there could be something out there to put the spotlight on how design in the tech industry was becoming truly impactful. Om Malik was a key Yoda along this journey, telling me over coffee one day, “Maybe you can make it happen.” I didn't know what could happen – but I knew that if I could somehow share what had been shared with me, the vision imparted by everyone I’ve had the chance to meet might come true. Searching the Web for information about the tech industry and design brought me to so many sources of information including Pew Research, Nielsen, Gartner, Forrester, IAB, the Cornell University Library, General Motors, IBM, Fortune, BusinessWeek, DesignerFund, Wired, the USPTO, Scientific American, the Processing Foundation, A List Apart, Emigre, Slideshare, Huffington Post, TechCrunch, Business Insider, Union Square Ventures, Andreessen Horowitz, Millward Brown, Atomico, the New York Times, Wikipedia, and so many more. Sifting through all of the data and matching it to what I had observed sat at the core of the report. My goal was to find data that mirrored the vision I had heard from designers in the tech industry. When I could find a valid hit, I couldn’t stop going. I didn’t have a research team – but I will readily claim Google as an awesome member of my team! I’ve given talks at TED, TED Global, and TEDMED that use a visual style of presentation that I’ve developed since the 1980s. Making the actual slides didn’t worry me as that’s something I know how to do. What I didn't know how to do was to go deeper on the talent side of the equation, and I didn’t know how to get it out into the world at scale. Understanding how organizations have changed with the growing importance of design in the tech industry wasn’t obvious to me, but I knew it could be a vital aspect of the report. Ever since I heard Klaus Schwab say at Davos – “Capitalism is being replaced by “talentism’” – I knew he had put the finger on what truly matters to any endeavor in business, or in life. That the people matter, and who they are and how they work with one another is what ultimately determines the success or failure of a company. So I was lucky that two partners at KPCB gave their full support to this project: Juliet de Baubigny on the Talent side, and Christina Lee on the Marketing and Communications side. Getting to work with members of their respective teams was pivotal for two key tasks: 1) Digging deep into expertise and know-how around design talent and teams inside the tech industry, and 2) Knowing exactly how to get the deck “to market” and send it out into the world at scale. Jackie Xu led the former, and Aviv Gilboa led the latter. Before coming to KPCB, Jackie led recruiting at Twitter and knows the ins and outs of “talentism” in Silicon Valley; Aviv launched Mary Meeker's Internet Trends Report online last year and had the know-how of distribution. Justin Sayarath, who supports the KPCB Design Fellows program (among other things), came in during the last hours of deploying the #DesignInTech Report. Working anecdotally could only get the report so far, and even with tons of productive Google searches there wasn’t enough knowledge about #DesignInTech concentrated in one place to access that was less than a few years old. Christina Lee suggested that I interview a few friends to get some data. Before I knew it, together with Jackie Xu we invited 110 designers in tech to participate. That group’s participation was absolutely invaluable – with folks from Twitter, Etsy, Facebook, Flipboard, IBM, Google, Sonos, Netflix, and more – and the picture began to form around the designer-to-engineer ratio at various stages of company development as culled by Jackie. 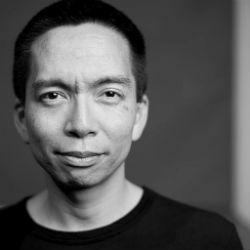 Another group was invited by my Twitter feed @johnmaeda, and 370 participants came aboard to provide more information for the study, including the finding that over 90% believe that designers should code. I fell out of my chair when I saw that statistic emerge. The journey to create the report reminded me of Lord of the Rings, so I wanted to capture that spirit. I recruited Ge Wang, who is a professor at Stanford and also the co-founder of SMULE. Professor Wang is a renowned artist and technologist, and he kindly offered a performance to add to the report’s debut at SXSW. His contribution underscores what just one new team member can do when they bring their magic. Ge created an unforgettable experience for the entire SXSW audience just three days before the deck went live, and which will be visible on Slideshare shortly. 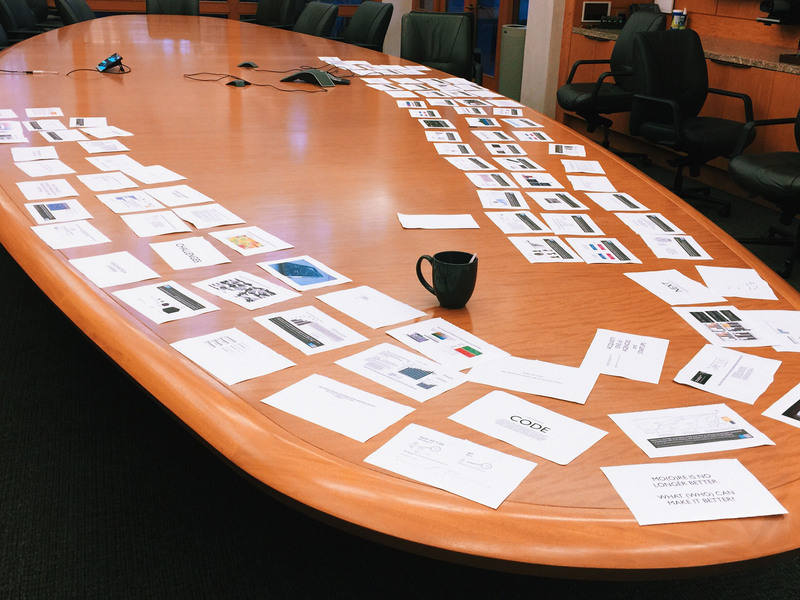 The photo above is of the status of the #DesignInTech Report on paper roughly two weeks out from the actual report. I laid it out on the big conference table at KPCB, and was getting nervous because it was already the second time I had re-built the deck. Subsequently after using all that surface area, I re-did the report three times as the deadline neared. Each time I did it, I was terrified that I had broken it. It’s the funny thing about writing a book on simplicity: You can easily forget how to make things simpler. But if I hadn’t redone the report multiple times, I am certain that it would not have been as good. I did so in response to previewing it to a new person – and I was fortunate to get good feedback each time. The problem with good (not to be confused with “positive”) feedback is that it can destroy your confidence. Either you can stand by your guns and feel that you are right, or you can listen all the way, don’t react immediately to everything suggested, let it all marinate, and then decide whether you need to start over or just lightly edit what you have. The quality of the feedback I received was so good that each time I had to do it over completely. Quentin Hardy and Benny Xian independently gave me invaluable feedback, and the impetus to start over again just days before the launch. I had promised all the participants in the study that I would give them a sneak peek of the data or of the presentation. But I was getting super tired towards the end. There were moments like that prototypical Bugs Bunny (apologies to the Pixar generation) animated sequence where you have the angel on one shoulder and the devil on the other – both are talking to you and trying to lobby you to do the right thing versus the wrong thing. From all of the kind notes that I’ve been fortunate to receive, I can see that it was important that I kept my promise. And in retrospect, I wish I had allocated more time to engage all the folks who contributed to this report. I once wrote on Twitter that incrementalism is a good strategy as long as you forget to stop. I realize that after the report’s birth, the angel and devil appeared on my shoulders again – one saying that it’s time to share how the report was made, and the other saying to go to the beach and forget about it. I guess I’ve listened to both, as I am very shortly about to take a nice break – but I am glad to have reflected on my experience and written this post first. Jackie Xu and I co-host a dim sum brunch for designers in the Bay Area, and we’ve been fortunate to create an electronic community together that’s resulted in a few “playbooks” for designers. If you're hungry for more #DesignInTech information, read the playbooks: There’s a lot there on how to recruit designers, time management tips, the importance of user research, career ladders for design, and more. We hope these will serve as resources for a new generation of #DesignInTech leaders.